Pleasant Living: "On the Road Again . . ."
"On the Road Again . . ."
"Just can't wait to get back on the road again." Those all to familiar lyrics to the old Willie Nelson song couldn't be a better descriptor of the way I feel about road trips with my husband. I LOVE driving across the picturesque countryside with my man behind the wheel and my tunes blaring through the speakers. This a source of pure enjoyment for me. Luckily, this summer Brian and I have had the blessed opportunity to partake of such adventures. If I had my way, we would've gone on many more. But we'd probably have to take out a loan just to put gas in our tanks, so that really hasn't been an option. Several weeks ago, we made the short jaunt to Dallas to celebrate my 25th birthday. 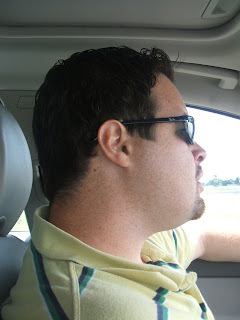 Here is Brian behind the wheel, and I can assure you that Coldplay's fabulous new CD was the soundtrack of that drive. We purchased it that weekend, and I think that we listened to it no less than 15 times. Fanatics? I think so. As you can probably already tell, we enjoy eating. Actually, I think that "enjoy" is a bit of an understatement. WE LOVE TO EAT. Here we are eating at Mi Cocina in West Village in Dallas. This was my first time at this restaurant, and I must say, it did not disappoint :). This was my meal. Do not despair. I didn't eat ALL of this, though I wanted to. A girl's gotta watch her figure though, right? In that same weekend, we made another road trip to a little town called Corsicana. 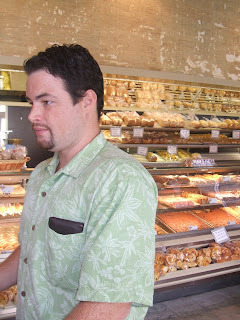 We had some business there, but we couldn't resist making a stop by the famous Collin Street Bakery. This place is known for their fruitcake. I wouldn't touch a fruitcake with a ten-foot pole, though, so we made our escape with jalapeno cheese rolls and a fresh peach pie. Yum, yum, yummy! Now, don't even begin to think that we waited until we'd made the long trip back home to enjoy our tasty treats. No sirree! 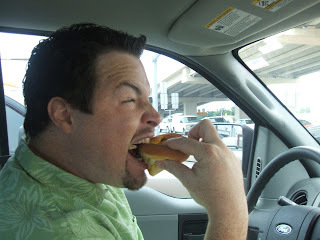 We plopped those bready wonders into our salivating mouths as soon as we'd retreated back to the privacy of our car. And, once again, our selections pleased us. 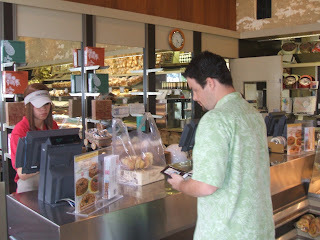 Just writing this post has made me yearn for another escape with my husband from the daily grind of life. I encourage you, too, to get away. Enjoy your surroundings with someone significant to you. It's good for the soul! It looks like you guys had a blast. Those trips are the best ones...just enjoying the scenery and company!! Lucky you! I wish My Better Half and I could go on a road trip in the near future. Unfortunately, we're booked for the next few weekends. I'm glad you two had a good time. what a fun trip! we've been to dallas a few times, but not anymore since we've moved so far away. i know what you mean about the fun road trips with the husband...i love it! we always have a great time together, and there aren't a million other distractions going on. Thanks for the sweet note. Scrapbooking is only something I started last year. I agree the mess it creates can not be contained. I use one of our spare bedrooms in our house and usually resolve the mess issue by closing the door. Your wedding was beautiful. I look forward to the next post. yes I agree Road trips are lots of fun. We are making the long trip to South Carolina in about two and a half weeks. It will be lots fun. I cant wait. what fun! The family is getting away this weekend! I can't wait! Road trips are so fun. They create such great memories!! Thanks for your comment this morning. What your (guest) pastor said is so true, it is so worth it to be a Christian. mmmm. yes. roadtrips. yummy to my soul. good post. fun pictures. This entry on your blog made me hungry. 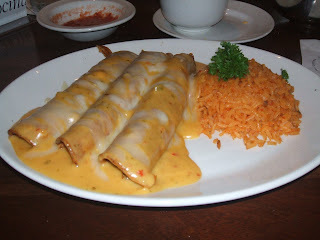 I love Mexican food and ALWAYS order the enchiladas! It looks like you both had so much fun together. I love times like that with my husband too. How fun! Enjoy the carefree days before you are blessed with children. It makes it so much harder to get up and go! OOOhhh how I love Mi Cocina! 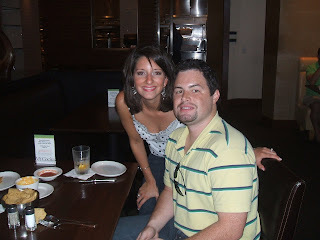 I live in the DFW area so any chance I get to go to a Mi Cocina I do! Yum!